Known for an abundance of mountain terrain, the great state of Tennessee is an outdoor enthusiast’s paradise, covered in forests, streams, waterfalls, and—of particular interest to mountain bikers—plenty of steep, rocky trails. This, of course, means that there are plenty of places to put your biking skills to the test and slice a satisfying ride on challenging trails. 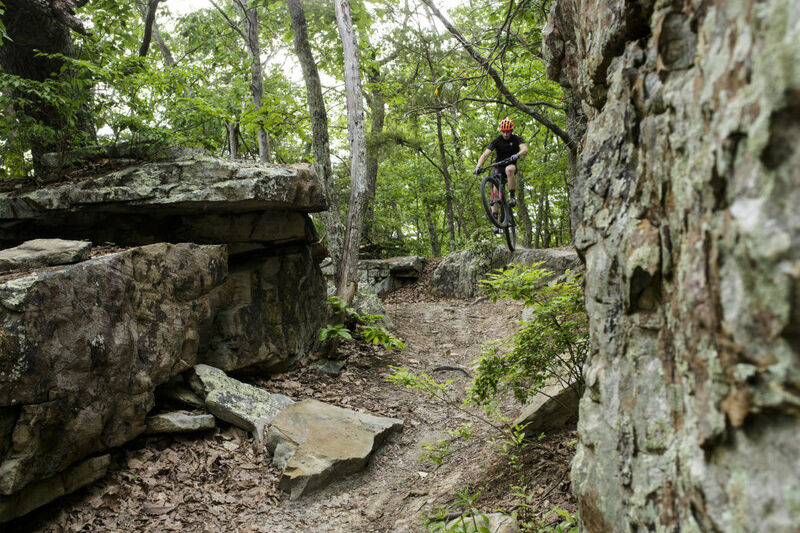 Whether you’re a timid first-timer or an advanced mountain biker, there’s a Tennessee trail to suit your needs and maybe even teach you a thing or two. For those just getting used to their first mountain bike or giving the sport a serious attempt for the first time in a while, Grand Gap Loop atBig South Fork National River and Recreation Area is a great place to start. With its flat, smooth terrain and overall lack of obstacles, the 6.4-mile ride offers plenty to feast your eyes on, thanks to the area’s thick forests and the trail’s tendency to trace its way alongside cliff edges—but never too close for comfort. Start at the trailhead near the spot where Grand Gap intersects with the John Muir Trail and take a counterclockwise ride up a shallow climb, which then flattens out and rewards you with views of the river and a nice, easy ride. Back in the Chattanooga area,Enterprise South boasts around 10 miles of flowing trails great for burgeoning MTB enthusiasts. Choose from three trails: Black Forest Loop, an easy, forthright loop with no major challenges and little elevation gain; TNT, which climbs quite a bit, has a fair amount of roots to traverse, plus access to a designated pump track; and Log Rhythm, which goes from a steeper climb to a long drop, with optional logs and bridges for those who want to change up the intensity level of the ride. The stacked loop system of theRaccoon Mountain Trail Network in Chattanooga is one of the most well-known mountain biking destinations in the southeastern United States. This network, which opened in 2007, has something for nearly everyone along the skill spectrum from beginner to advanced. It’s quartet of trails with black diamond ratings makes for a strenuous series of rides for experienced cyclists who want to see firsthand why this spot is so popular. Choose from the .7-mile Lower Chunky trail, the 2.4-mile Megawatt, the 3-mile Live Wire 2, or the 3.1-mile High Voltage, the last of which boasts a nearly 1,500-foot climb across a particularly short distance. Not one to mess around when it comes to offering options for outdoor recreation, Knoxville is known for its city parks and wide range of things to do outside. So, it’s no surprise that the city offers more than a whopping 35 miles of multi-use trails in a system known asUrban Wilderness—a comprehensive web of mostly closed-loop trails, strategically placed around a central artery. Check out the 12.5-mile South Loop for a solid intermediate ride, which has some more technical offshoots worth exploring if you want a bit more of a challenge. 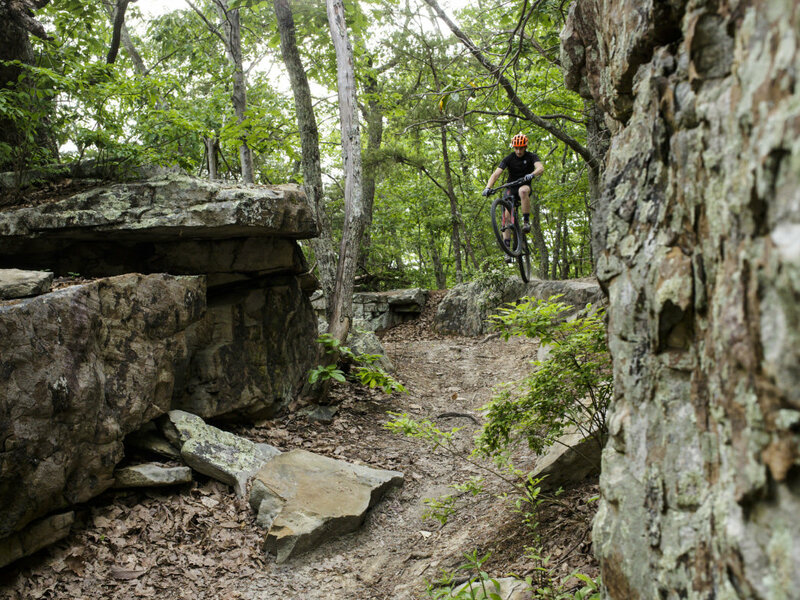 Try the 6.6-mile Mead’s Quarry Loop within the Ijams Nature Center to get some quad-burning climbs in, or the trails in the William Hastie Natural Area, especially the short (0.4 miles) but technical View Park Trail. In far northeast Tennessee,Warriors' Path State Park encompasses 950 acres on the Patrick Henry Reservoir. Its MTB trail system has the distinction of a National Recreational Trail designation, thanks to the beauty and rigor of its 8.5 miles of scenic bike trails, which also allow hikers to pass through. Ranging from beginner to advanced, the easier trails include the gentle .6-mile Fawn Loop, intermediate options span from the kidney bean-shaped loop of the .4-mile Pawpaw to the secluded 2.2-mile Wahoo, and the toughest trails are the 1.9-mile Boneyard with lots of rocks and downhill zoom and the aptly-titled Darwin’s Revenge, which only the fittest can master due to its consistent climbs and descents with plenty of rocky sections along the punishing route. TheTanasi Trail System at the Ocoee Whitewater Center is a tough and, in some places, remote series of longform challenges deep in the Cherokee National Forest. Full of singletrack adventure, you’ll find more than 20 miles of trails here, capable of satisfying even the most obstacle-hungry riders. Those seeking a full day’s worth of exhaustion in the spring, summer, or fall can bring their drop bags to race loops like the rooty, multidimensional Cohutta 100 or the nearly-as-strenuous Big Frog 65. For a short but exhilarating ride, the Thunder Rock Express is 1.5 miles of high-speed flow with a rewarding downhill flush. Last but not least, encompassing around 9 miles of singletrack, about a half-hour northeast of Nashville, the Lock 4 MTB trail system offers three connecting loops: the beginner-friendly Eastside Trail ("green loop"), the intermediate Westside Trail (“yellow loop”) and the intermediate Southside Trail (“orange loop”). The most dynamic of the three is the orange loop, with three advanced sections, all of which snake off from the main trail and should only be attempted by experienced riders. Of those, Rock Garden and Smack Down offer rock ledge drops and climbs, while Rolling Table is a jump line made for repetition. Slightly less advanced riders can stick to the loop and enjoy its more accessible challenges, while novices can gain experience on the green loop without overtaxing themselves.